In the year 2025, ​a young man's superintelligent AI system tells him that he must go on a date or face certain suicide from loneliness. Admittedly, I wish Turner’s film didn’t lean so heavily on the aforementioned “loser who gets the girl” trope (something that I’m a bit exhausted with ever since Apatow popularized it in the early aughts). But, to be fair, 2025 manages to undercut its dorky guy wish fulfillment with some fun turns and a great final reveal. Beyond that, there’s charm and creativity to spare here, with heaps of fun and quirky world building elements that seem both horrific, yet oddly plausible. From mouthy AI virtual assistants to VR schooling, Turner does a great job making his protagonist’s day-to-day routine so pathetically relatable. We often associate great sci-fi world building with films that are either super-dramatic or filled with tons of visual effects work. But, 2025 proves that this sort of scene-setting is also necessary on a smaller scale. 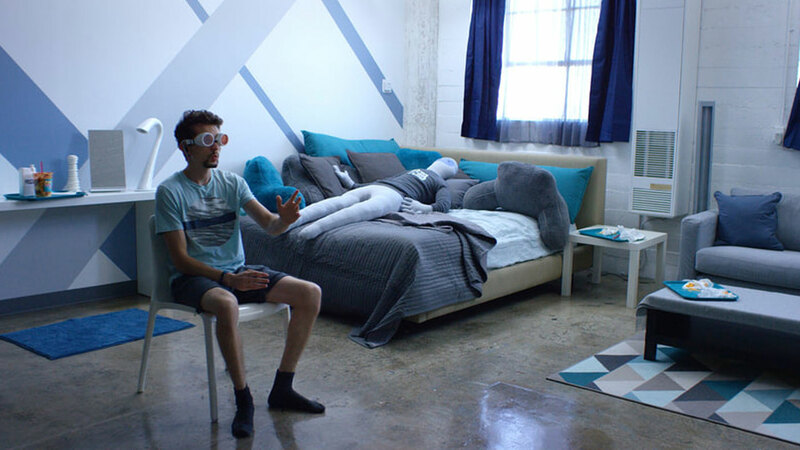 Daniel, our introverted hero, is surrounded by various site gags and future-tech doohickeys that not only craft a defined sense of place, but also instantly put us into the main character’s head space. Major kudos to the strong prop work and production design—both really carry the film to that next level, especially considering it basically takes place in one room. Credit to the film’s production designer, Tiff Smith. The film is, for the most part, a breezy affair. But, it’s not just fluff either. Turner is tapping into deeper themes like digital alienation and depression, but he approaches it all with an accessible comedic lens. It’s incredibly refreshing to see a sci-fi film touch upon these topics in way that isn’t dour or self-serious. Rather, Turner treats the subject matter with a comforting 80s teen movie vibe, achieving a tonal balance between goofy comedy and saccharine meet-cute. A working commercial director in LA, Turner is currently finishing up a new short film, Pull Yourself Together (Kickstarter here). And, like so many young directors, he’s also working on getting his first feature off the ground.